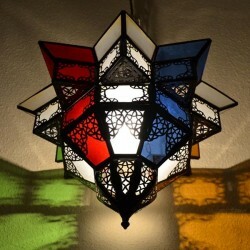 Illuminate living room, bedroom and dining room with glass ceiling light shades of Arab and Moroccan handicrafts. 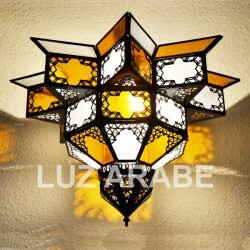 Arab glass ceiling light shades are perfect for low ceilings with indirect light of romantic effect. 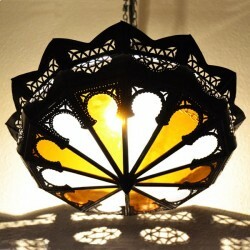 The variety of Moroccan ceiling lights offered in this section gives the choice between various styles of decoration with elegant ceiling light shades. Enjoy the magical world of Arabian Light. Glass ceiling light shades There are 4 products. 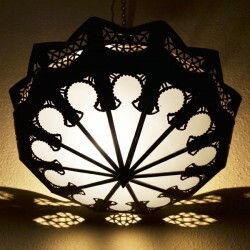 Ceiling light shade of handcraft pierced iron and white color opac glass, Arabian style Three sizes INCLUDED: Electric pendant in black (ceiling rose, lamp holder, and cord 80 cm) Dimensions:Small: 33 cm of diameter, Medium: 40 cm of diameter,Large: 40 cm of diameter.